Terrain view has been a part of Google Maps since 2007 in various forms, according to Wikipedia. It’s not something you see around very much, though; most websites seem to use the default Road map view in their dynamic or static maps. Because of this, when I came across it in use in the web-based view of The Scoop, The New York Times’ city guide, I was confused by what exactly it was. The terrain maps are not an obvious choice for an urban setting, and yet they are beautiful in a minimalist way. Google’s road map design has been lauded for its readability, and the terrain maps lack much of the detail present in the road maps. 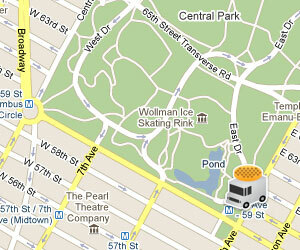 In the Terrain map, the park comes alive as a dynamic, undulating oasis in the city. In the Road map, it is lost in the details and color of the surrounding streets and the roadways that invade the green space. 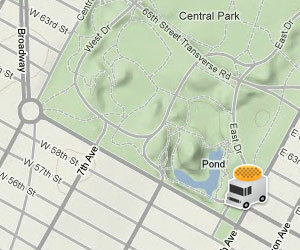 I’m tempted to use the Terrain maps in a current project of ours that maps food trucks in New York City. There are a few things to think about before making a decision, though. The biggest consideration is that the Terrain maps only seem to go to a maximum zoom level of 15, shown in the screen shot above. Our project does not require a high level of accuracy, since the location data we have is approximate. However, there are often multiple trucks clustered around certain intersections, and the ability to zoom in closer helps separate the trucks for interaction. It could be argued that the familiarity of the Road map helps orient users and provides some credibility, but I’m not sure that argument has much weight. A big advantage of the Road map is the landmark information, such as subway stops, neighborhood labels, and well-known locations. This is a big plus for visitors to New York, but probably not so much for people who are familiar with the city. I suspect that the flatter colors and lower details in the Terrain maps make for lower tile file sizes, which might help for mobile viewing. I have not been able to test this idea, however, so I don’t know for certain. I still can’t decide. Perhaps the way to go is to split the difference and use the Road maps for the higher zoom levels.